PROPONENTS of the Tehri Dam Project (TDP) have had the rug pulled from under their feet. The Soviet engineers who were supervising the project have gone home and money from the former Soviet Union is in jeopardy. So far, no alternative source of finance has been found for the Rs 1,000 crore that the Soviets were to give. India's own funds are heavily constrained. It looks like the Rs 5,100 crore TDP is entering a new phase. But the final word on north India's largest multipurpose dam has yet to be spoken. The Prime Minister, P V Narasimha Rao, left incomplete the May 7 meeting he had convened to review the project. However, Narasimha Rao has disallowed the resumption of blasting at the dam site, which was stopped in deference to environmentalist Sunderlal Bahuguna's insistence and 46-day fast. If it does come into existence, the Tehri dam will be one of the highest in the world, impounding the 16 Bhagirathi and Bhilangana rivers. It will be 260.5m high and will create a reservoir over 42.5 sq krn in area. It will displace some 85,000 people from the 200-year-old Tehri town and its nearby villages. The dam's foundations, diversion tunnels and part of the head race tunnels have been completed and Rs 730 crore spent. Work on the New Tehri town, some 15 krn away, is also well underway. Construction of the coffer dam was to start this year but has been delayed as this year's building season, which extends from November to June, has been lost because of Bahuguna's fast, according to B L Jatana, executive director (projects) of the Tehri Hydro Development Corporation (THDC). Narasimba Rao has held out an assurance that an expert committee, the fourth in 12 years, will be appointed to "evaluate all aspects of the dam". Everyone associated with the dam is awaiting the formation of the committee to see how serious the government is and what it intends to do. Sunil Roy, who reported the results of the first review committee on the dam in 1986, suggests that the proposed committee should consist of independent unbiased experts. "This itself would mark a departure from earlier committees which were comprised of people from different interest groups," says Roy. The government has in the past over-ruled two panels of the Ministry of Environment and Forests (MEF) which had looked into the project. Shekhar Singh of the Indian Institute of Public Administration, who has served on the MEF's committee to review the environmental impact of dam projects, says: "There are pressures acting on the government which could go against the interests of the environmental lobby. The saving grace is that because of the Prime Minister's intervention, the report of the proposed committee will definitely be heeded." The committee of which Singh was a member had recommended in 1990 that the dam be scrapped, but it was criticised by the pro-dam lobby for lacking seismological expertise - the mbst contentious issue with the dam especially since the recent Garhwal earthquake. The'third committee, which comprised earthquake experts, was set up by the Committee of Secretaries in 1990 to evaluate the safety aspects of the dam. While the committee cleared the project, geologist V K Gaur, former director of the National Geophysical Research Institute, sent in a dissenting note saying the dam was not seismically safe. Conditional clearance On July 19, 1990, the MEF granted the TDP conditional clearance. The THDC, set up in 1988 to oversee it, was supposed to implement these according to a given schedule. By March 31, 1991, it was to have prepared plans for rehabilitation, command area development and disaster management. By December 31, 1990, THDC was to have drawn up a plan for catchment area treatment. It was also supposed to set up stations for monitoring the quality of water. Shekhar Singh and N D Jayal of the Indian National Trust for Art and Cultural Heritage (INTACH) say that these conditions have not been met. The government should have stopped work on the darn long ago. No explanations are forthcoming about this delay and the ministries concerned - water resources, power and MEF - have merely passed the buck. The minister of state for environment, Kamal Nath, told Parliament that he would withdraw clearance for the dam if the conditions were not satisfied. But after Bahuguna's fast, he argues that since the Prime Minister has evinced personal interest in the TDP, the ball is now squarely in his court. The MEF will not take any steps to withdraw clearance without a nod from the Prime Minister. The UP government and THDC have said that they have submitted their plans to the Centre, as required by the MEF while granting clearance, but have received no response despite repeated missives. Meanwhile, people on both sides continue to fire salvoes at each other. THDC chairman S P Singh feel there is no need for further review of the dam. He claims that the Moscow Hydro Project Institute has certified the dam as being seismically stable. These studies were done at the behest of V K Gain, who, as a member of the last review committee, had sent in a dissenting note. Gaur says he has to see the full report before he can be convinced of the significance of these findings. He says, "Singh's statement fails to give any technical details about the tests conducted. The dam would have to be subjected to certain peak ground accelerations (PGA) at its weak points. Merely saying that the model has been subjected to a 'certain PGA and found safe makes no sense." Opposition to the dam has also come from unexpected sources. The Bharatiya Janata Party MP from Garhwal, Mahabendra Shah, says the local people have not fully understood the implications of such large dams; run-of-the-river projects, involving a series of barrages, would be more appropriate. Shah's criticism goes against the poicy of the BJP-run state government in Uttar Pradesh which is very keen to push ahead with the dam. Resistance to the dam started almost as soon as the Geological Survey of India proposed the project in 1949, because of the site being located in a highly seismic region. Real opposition, however, began to build up in the late 1980s with the growth of the anti-dam movement in India. The main support for the dam comes from the THDC officials and contractors, as well as some of the oustees. One of THDC's managers, H M Vyas, expresses an extreme opinion. "Environmentalists are anti- national and should not be allowed to interfere in matters that engineers know best." J P Latt of Karam Chand Thapar and Brothers, a company which is involved with the construction of the dam, echoes this: "Tehri residents should be forcibly evicted as the whole project has been delayed enough. " Many of those from the Tehri region, resettled at Raiwala near Dehradun also support the dam. 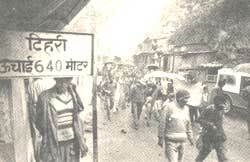 They were evicted in the early 1980s from Khandgaon to make way for THDC colonies. "If1he dam doesn't come up, our resettlerfient may never get completed. We will be at the mercy of the revenue authorities and may never get ownership rights," says RQop Chand Singh Negi, a retired armyman. Opinion in the district about the dam is divided. journalist Prem Singh is dead against it as "it will submerge the culture of the Garhwali people. How will the THDC reconstruct the sacred shrines to be found in almost every village?" But local politician Budev Lakhda, who is adhyaksh of the zila parishad, is vehemently in favour of the dam. He says the country's development should not depend on a sin- gle man's whim. Others are taking a pragmatic approach. People in Tehri in particular have taken large amounts of money as compensation, but are showing no signs of moving to New Tehri. Many people are happy to see the status quo maintained. As a result of this massive project, the town's market has grown since the early 1976s and a few people have prospered. The long struggle has also drained the spirit of many environmentalists. YoulTig Anita Nautiyal, Bahuguna's niece, says, "The struggle has gone on too long and people are losing interest. though I don't believe the dam should be built, like so many others, I don't have the patience to wake up every morning at five am to participate in the early morning walk that the activists on dharna take through the town each morning. " The environmentalists' lobby has decided to fight at different levels now with two people having filed a petition in the Supreme Court. The petition argues that since the conditions for environmental clearance have not been fulfilled, this should be withdrawn. The petition also argues that Jaikrishna, a former vice-chancellor of Roorkee University who reviewed the MEF committee's report, cannot be considered an unbiased expert. Notices have been issued, but no date has been set for the hearing. Whether Tehri will now go ahead or not will depend on the Prime Minister's perceptions. But if his message is not green, it will depend on the envirom-nentalists' spirit to carry on the struggle. Ultimately, it will depend on whether India can find the money to build the dam.